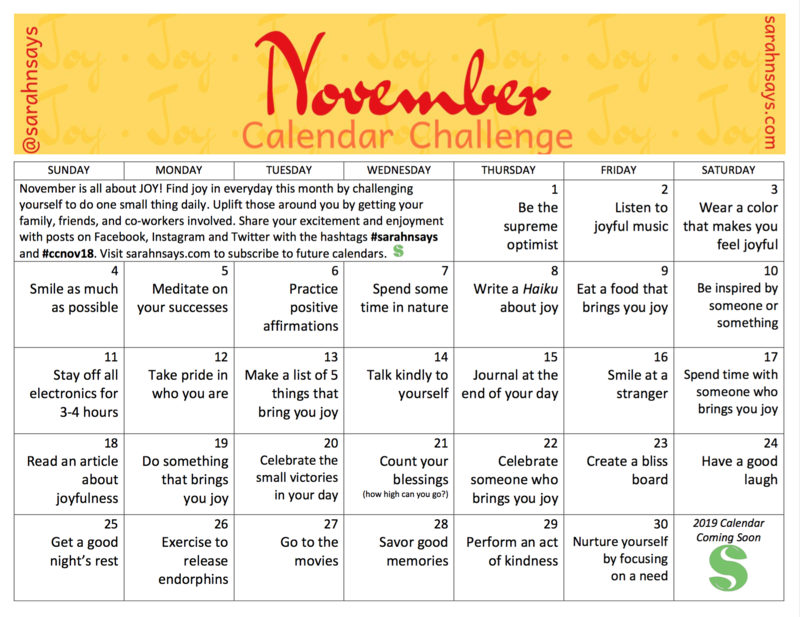 November is all about JOY! Find joy in everyday this month by challenging yourself to do one small thing daily. Uplift those around you by getting your family, friends, and co-workers involved. Share your excitement and enjoyment with posts on Facebook, Instagram and Twitter with the hashtags #sarahnsays and #ccnov18. Visit SarahnSays.com to subscribe to future calendars. October is the month for starting healthy habits. 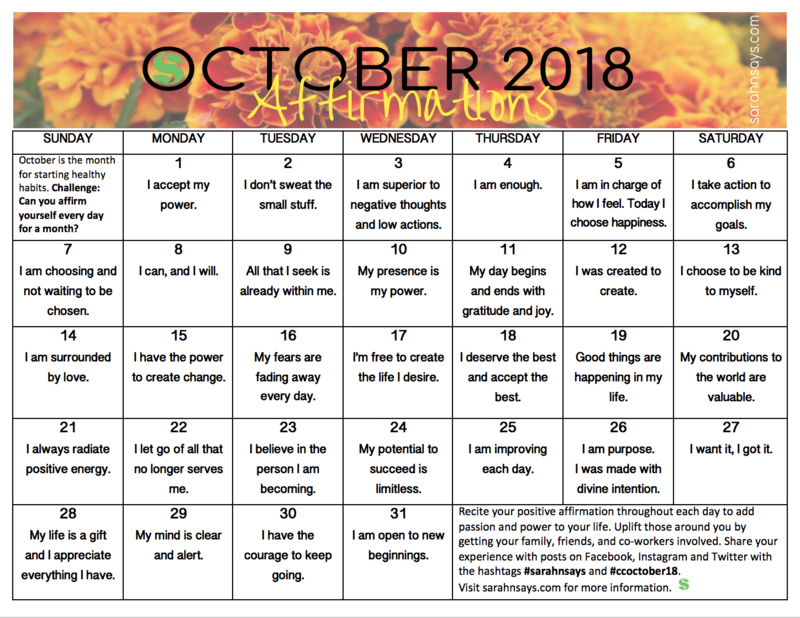 Challenge: Can you affirm yourself every day for a month? Recite your positive affirmation throughout each day to add passion and power to your life. Uplift those around you by getting your family, friends, and co-workers involved. Share your experience with posts on Facebook, Instagram and Twitter with the hashtags #sarahnsays and #ccoctober18. 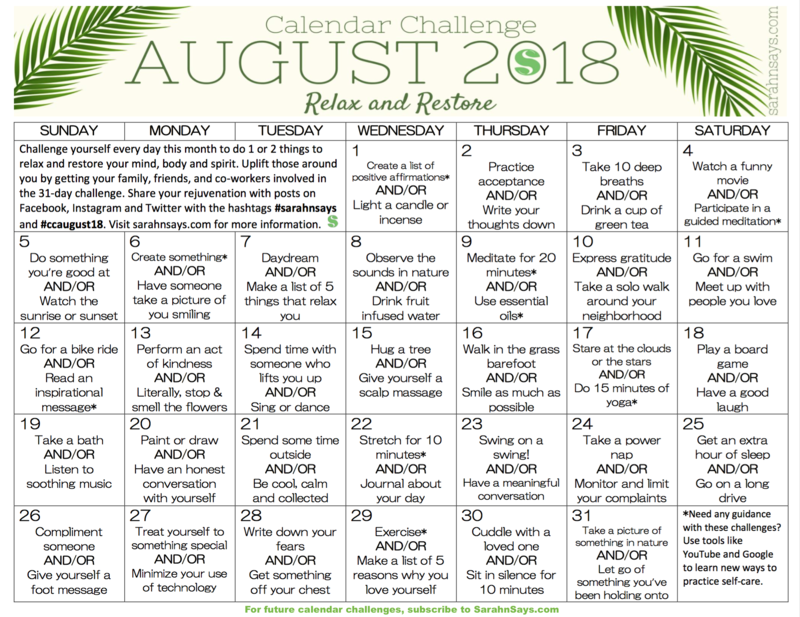 August is a month for Relaxing and Restoring! 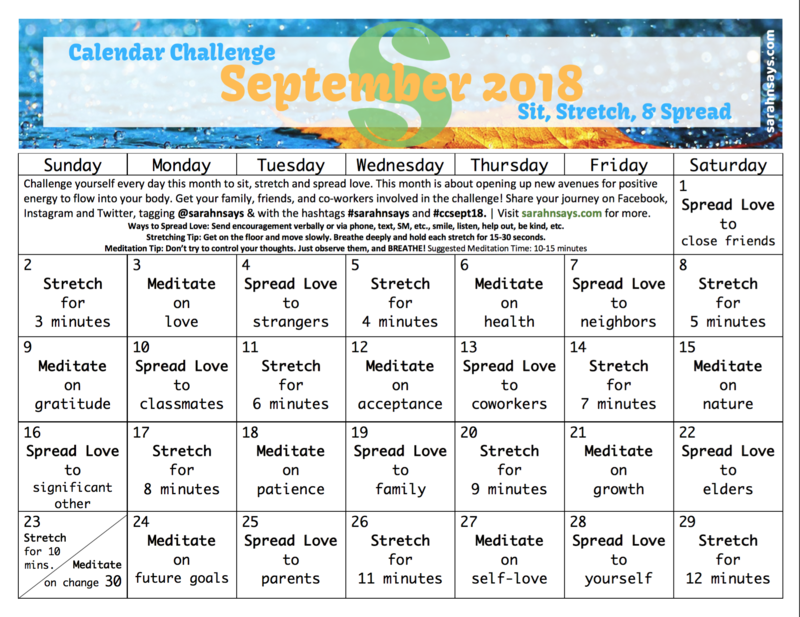 Challenge yourself every day this month to do 1 or 2 things to relax and restore your mind, body and spirit. 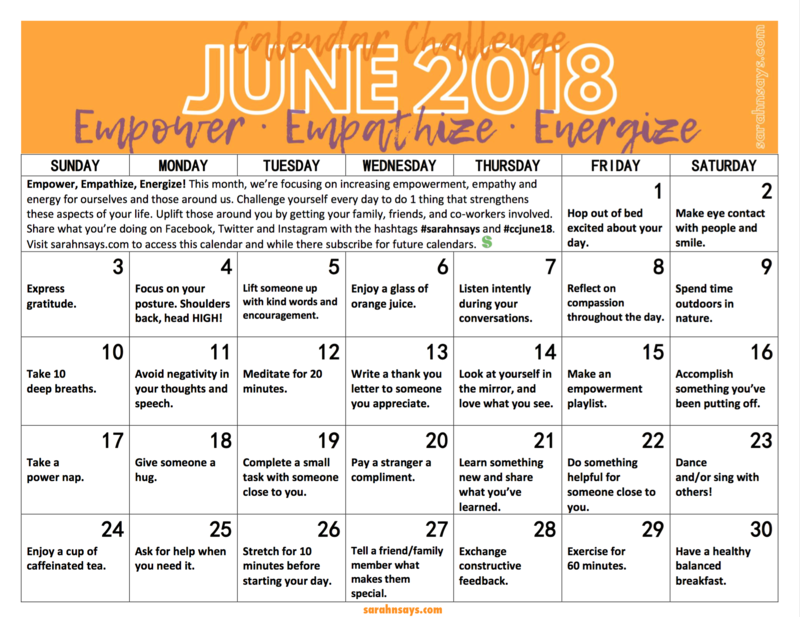 Uplift those around you by getting your family, friends, and co-workers involved in the 31-day challenge. Share your rejuvenation with posts on Facebook, Instagram and Twitter with the hashtags #sarahnsays and #ccaugust18. Visit sarahnsays.com for more information. “Their Eyes Were Watching God ” by Zora Neale Hurston. This book is a 1937 novel about a young woman, Janie Crawford, and her journey through navigating love, maturity, and spirituality as she seeks fulfillment in early 20th century Florida. 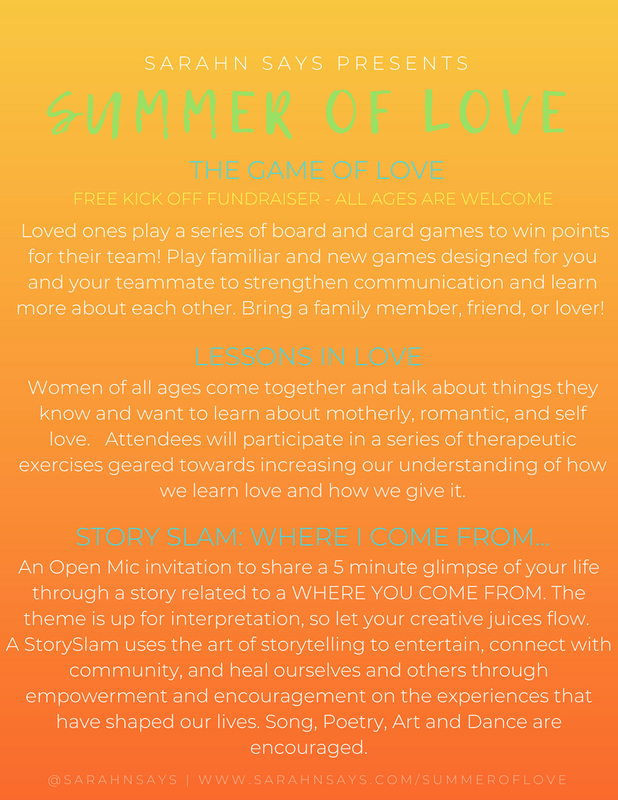 This month, we’re focusing on increasing empowerment, empathy and energy for ourselves and those around us. Challenge yourself every day to do 1 thing that strengthens these aspects of your life. Uplift those around you by getting your family, friends, and co-workers involved. 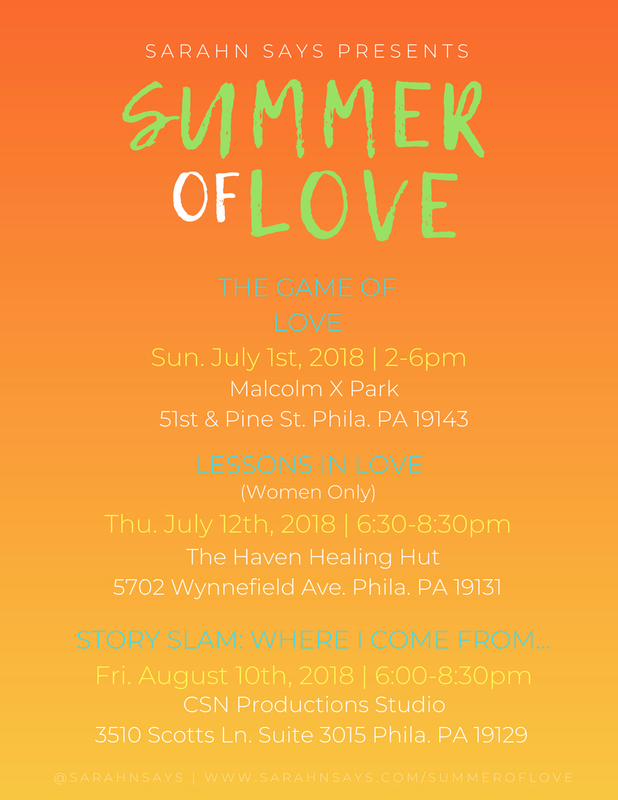 Share what you’re doing on Facebook, Twitter and Instagram with the hashtags #sarahnsays and #ccjune18.